It is fair to say that Cotonsport FC currently is the best team from Cameroon, leading the MTN Elite One 2010-2011 with six points. Cotonsport FC is from Garoua, the capital of the North Province of Cameroon, and even though the club has been dominating Cameroonian football for the last couple of years, information about their matches are sometimes very hard to find, most likely due to the fact that Garoua is far away from Douala and Yaoundé. Cotonsport FC has for the last years been specializing in developing talents from other West-African countries, especially Niger, Chad, the Central African Republic and Burkina Faso. Their current team looks very strong and has a nice blend of talented, hungry players and more experienced campaigners. Daouda Kassaly (born 19.08.1983), is first choice goalkeeper and arguably the best goalkeeper in the Cameroonian league. The towering number one is also the goalkeeper of the Niger national football team. Kassoure Ekiang Moumine (born 23.03.1989), from Chad, provides an excellent backup. Nack Balokog (born 10.09.1986) and Epassi Ewonde (born 19.08.1988) are two rocks in defence. Ambroise Oyongo Bitolo (born 22.06.1991) is a left-back for the future and member of the Cameroon U-20 national football team. Burly defensive midfielder André Ndame Ndame (born 30.04.1984) has been a revelation this season and was part of the Cameroon national football team last month. Nicolas Alnoudji (born 09.12.1979) has about twenty matches for the Cameroon national football team and is the most experienced member of the team. Alnoudji featured for several European clubs, including Caykur Rizespor(Turkey), US Créteil(France) and SC Olhanense(Portugal). Aggressive and creative midfielder Arnaud Monkam Nguekam (born 22.02.1986) spent three years in Norway, playing for SK Brann and Løv-Ham Fotball. The picture, taken from Aftenposten, is of Monkam Nguekam from his days at Løv-Ham Fotball. The attacking midfielder Baba Ousmaila (born 26.09.1986) returned to Cotonsport FC before the current season after spending the 2009-2010 season with Tunisian outfit El-Gawafel de Gafsa. 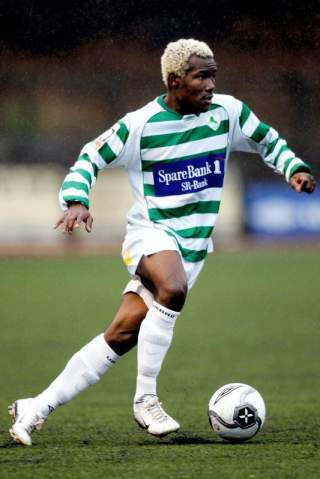 Playmaker Joël Moise Babanda (born 12.01.1980) has experience from the Algerian league with ASO Chlef. Talented attacker Jacques Haman (born 30.08.1994), presented in my post from 23.03.2011, is arguably the most interesting teenager in Cameroonian football at the time of writing. Petit winger Edgard Salli (born 17.08.1992), presented in my post from 09.10.2010, is currently on fire and won the Player of the month-award for January 2011 in Cameroonian football. Salli is known for his amazing dribbles. Ewangue Mbongo (born 13.03.1993) is another highly gifted teenage striker. However, the star striker of the team is Hilaire Momi (born 16.03.1990), the goal poacher from the Central African Republic, presented in my post from 10.10.2010. Momi is the current top goalscorer in the MTN Elite One 2010-2011 with nine league goals. AS Lausanne from the Cameroonian capital could very become one of the weakest teams in the history of the Cameroonian top division. AS Lausanne has currently lost 12 of 14 league matches and have only two points to their name. The busiest man at the club is arguably goalkeeper Mouthe Ekono. Ekono has been impressive in several matches and has experience from Union Douala and Unisport FC. Sadrack Olivier Bakang (born 28.05.1972) is leading the defence, a tough job for one of the oldest players in the league. Bakang has also featured in a midfield role. Souleymanou Mandjombe (born 03.05.1987) was a key midfielder in the first matches of the season but decided to join Tiko United FC in January 2011. It is sometimes difficult to find information about AS Lausanne, a rather unfashionable team without media attention, but I have the impression that several of their best players have left the sinking ship during the last couple of months. Midfielder Jean Francis Mendoua (born 13.08.1985), who has a decent CV in Cameroonian football, started the season as the playmaker of AS Lausanne but have not featured since January 2011 as far as I can tell. The same seems to be the case for striker Abdoulaye Kouty Ntepe (born 28.05.1985), formerly of Astres Douala and Roumde Adjia FC. Oscar Hiobi Hiobi and Luc Mendouga Nguini (born 18.09.1978) have been brought to the club to add some experience. Mendouga Nguini has featured for several top Cameroonian clubs, including Cotonsport FC and Canon Yaoundé, and played for Renaissance FC de Ngoumou in 2009-2010. Rodrigue Lontio and Mexes Ken Kiyoh are both brave key players. Lontio has been captaining the team. Peguy Nya Sadjo (born 1991) is a skillful defensive midfielder with good tactical abilities and an impressive physical presence. Guy Francis Minla’a (born 16.10.1986) will most likely be important for the attacking line of the team. Willy Akono is the highest scorer of the team with 2 of their 6 goals. Not all the players are featured in your review. Especially I expected to see a report about the foreign players, 3 Nigeriens, and one Burkinese. What is the news about them? Any new transfers??? Thank you.